Beer, beer and more beer at CRT’s newest event! Caterham Round Table are delighted to announce that they will be hosting the town’s first independent real ale and cider festival, in November, later this year. There’ll be around 40 real ales, ciders and perries all under one roof. The event will take place over two days at Caterhams’ Soper Hall in Harestone Valley Road on Friday 22nd and Saturday 23rd November. Tickets will be going on sale in October but, in the meantime, there are plenty of opportunities to either volunteer to help at the event or sponsor one or more of the firkins of ale that’ll be on offer. There are also a number of major sponsor opportunities to take advantage of. Check out the festival mini-site for more details. Waller Pain gets it’s best attendance yet! More than 70 riders took to a very chilly hill this Sunday, many of whom had travelled quite a distance to attend. Including two of last years’ winners. 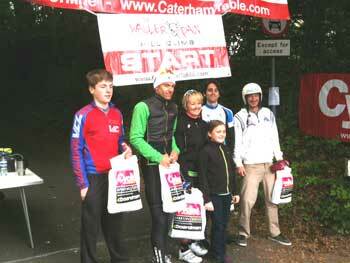 It was also great to see so many tweets, blog and club website entries about the climb in the run up to the event. It’s obviously gaining a lot of support amongst keen cyclists. Proceeds from this years’ event will be donated to the ‘Save the Velodrome‘ appeal. Our Wednesday meeting, the Caterham Carnival and Waller Pain… A busy week ahead! 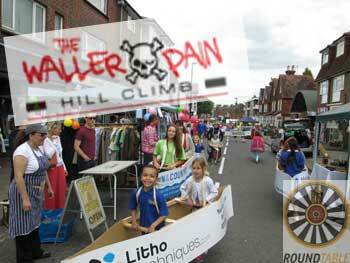 It was great to meet so many new people at last Sunday’s street party in Caterham High Street. The boat race was great fun, as always. Hopefully, some of you will come along to Wednesdays’ meeting (19:45, downstairs at the Surrey national Golf Club) when, amongst other things, we’ll be enjoying Andy Thomas telling us all about some of the latest conspiracy theories. Always a fascinating and thought provoking talk.